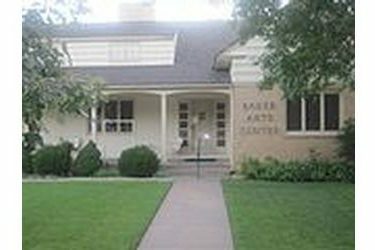 Postcards From The Plains, " a miniatures show by the Nebraska Impact Artists, will be featured August 8th through October 3rd at the Baker Arts Center, 624 N. Pershing in Liberal Kansas, with the opening reception on Friday the 8th from 5:00 to 7:00 pm. Each artist produced two works, with encouragement to make one of them more edgy or avant-garde than usual. There are assemblages and collages, small ceramics (porcelain post cards), a colorful bird sculpture, a sculpted figure tangled in webs of strings, wooden boxes opening into painted landscapes. There are landscapes, cows, still lives, figures, a self-portrait treading water, a tintype photograph of a war bonnet, abstract and near-abstract designs. From traditional to unusual, the miniature gems in "Postcards from the Plains" provide a big impact in a small space. Current Impact members include Roberta Barnes, Halsey; Wava Best, North Platte; Jo Brown, Lincoln; Patricia Coslor, Sargent; Ben Darling, Sidney; Judy Greff, Ashland; Debra Joy Groesser, Ralston; Susan Hart, Cozad; Janna Harsch, Greenwood; Rick Johnson, McCook; Beth Jasnoch, Kearney; Howard Kaye, Lincoln; Sammy Lynn, Glenvil; Liz Shea -McCoy, Lincoln; Julia Noyes, Lincoln; Sharon T. Ohmberger, Firth; Amy Sadle, Syracuse; Patty Scarborough, Geneva; Donna Schimonitz, Lincoln; Patsy Smith, Brady; Kit Watson, Chadron; Sandra K Meyer, North Platte; Michael Montag, Omaha ; and Norma Stevens, McCook.